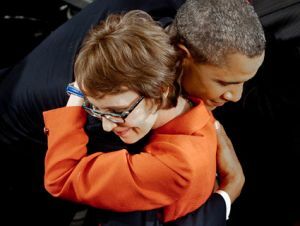 In case you missed it, Gabrielle Giffords’ arrival for the State of the Union on Tuesday night was something to behold. In a House chamber so often filled with vapid political theater, the recovering congresswoman’s presence drew a powerful and authentically poignant response—watch it here. Sadly, the bloodbath she barely survived in Arizona a year ago and its aftermath do not seem to have tempered America’s poisonous politics at all: Just hours before Giffords got a standing ovation in Congress and embraced President Obama, some unknown stalker was targeting four female Democratic lawmakers in Missouri’s Capitol with rifle crosshairs. Details are in my piece from last night over at MoJo.